Wilson Custom Marine “blueprinted,” or fine-tuned, the lower units on Mercury Racing No. 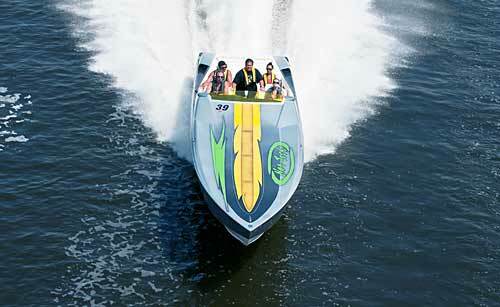 6 drives powering this 39′ (11.9m) Nor-Tech, and the boat’s top speed increased by 11 mph. A week after a white-knuckle 106-mph ride in his 39′ (11.9m) Nor-Tech offshore performance boat, Jamie Pellizzi was looking down at his boat’s GPS while his friend Nick Buis drove. Pellizzi said, “I was hitting him on the arm saying, ‘Look, look.’” The GPS read 117 mph. With no alteration to the bottom or engines, Pellizzi’s boat had picked up 11 mph because Wilson Custom Marine in Stuart, Florida, had “blueprinted,” or fine-tuned, the lower units on the Mercury Racing No. 6 drives. The higher top speed was the direct result of improved handling. “The more stable and safe the boat feels, the faster you can make it run,” said Craig Wilson, president of Wilson Custom Marine. Pellizzi had bought the boat used, without engines, but it had Mercury Racing’s wet-sump No. 6 drives. Now living in Tampa, Florida, Pellizzi returned to his native Long Island, New York, to invest in a pair of 1,000-hp (746-kW) models from Zul Racing Engines. Buis is one of two principals of Statement Marine, based in St. Petersburg, Florida. It builds high-end offshore boats (a 37′/11.3m center-console, 42′/12.9m V-bottom, a 50′/15.2m catamaran) and re-rigs and maintains offshore performance models for a small group of customers. He and Pellizzi rigged the 39′ Nor-Tech with the new motors and started testing propellers. With a pair of Hering 34″ (86.4cm) pitch stainless-steel propellers, the boat would pull to the right at 100 mph. That limited potential speed and, more importantly, made Pellizzi uncomfortable. The lower unit on a Mercury Racing No. 6 drive after blueprinting. Wilson Custom Marine was the first company to fine-tune a drive’s lower unit. Pellizzi talked to Craig Wilson at Wilson Custom Marine about improving his boat’s handling. For $5,000 WCM would blueprint the drives’ lower units, but Pellizzi just couldn’t see how the lower units could make that much difference. Later, when Wilson was at the Statement shop to pick up drives for another boat, he asked Buis about the Nor-Tech and explained why Pellizzi was having the handling problem and how he, Wilson, would fix it. Even though Wilson never mentioned improving the boat’s maximum speed, Buis convinced Pellizzi to send his engines’ lower units with Wilson as well. Wilson’s father, Mark, worked for decades at Rolla Propellers and is now with Twin Disc, specializing in the setup and design of Arneson surface drives and associated propellers. When Dubai’s Victory Team was dominating offshore racing in Europe in the 1990s, Mark Wilson blueprinted the lower units on all the raceboats’ drives, sweeping back the skeg angles and refining the shape of the bullet. He taught his son the process, and now Wilson Custom Marine is the only shop in the United States offering the service. With its reshaped bullet and swept-back skeg, this blueprinted IMCO Xtreme outdrive will improve overall performance and handling. Craig Wilson said that bullets on the leading edge of a lower unit are almost always deformed and that virtually every skeg he sees is twisted or out of alignment with the upper half of the drive. 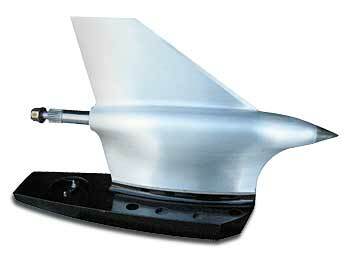 The imperfections in the surface of the bullet and skeg create air pockets for the water rushing past to the propeller. These “holes” in the water reduce the efficiency of the propeller, and adversely affect the boat’s handling. After blueprinting, the lower unit cuts through the water more cleanly, enhancing stability, improving efficiency, and reducing the rpm needed to get the boat on plane. Because the drives are straight, there’s less torque on their internal components and less stress on the boat’s transom. 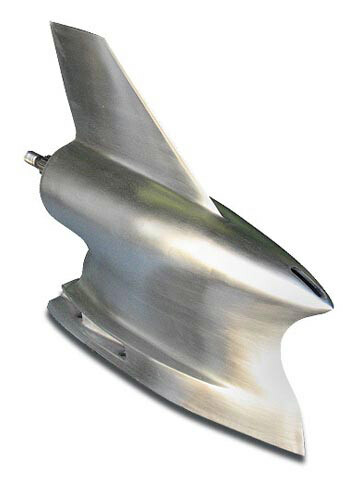 Primarily, Wilson Custom Marine has fine-tuned drives from Mercury Racing, Ilmor Marine, and IMCO because their lower units are brushed aluminum—not painted, like a MerCruiser Bravo One, for example. Wilson has looked at Mercury Racing’s new M8 drive, which is paired with its 1350 twin-turbo motor, and thinks his company can improve that lower unit as well. Prices for blueprinting start at $4,000 per pair on Mercury Racing’s Sport Master lower units for Bravo One drives. In addition to drives, Wilson Custom Marine will blueprint a hull bottom and adjust the balance by positioning engines and equipment to establish correct centers of gravity (longitudinal and lateral). Craig Wilson said that after a full makeover, one boat gained 15 mph. “A lot of these people had no idea how crucial balance is,” he said.